Receivers are the offense’s most critical position group to monitor in August. 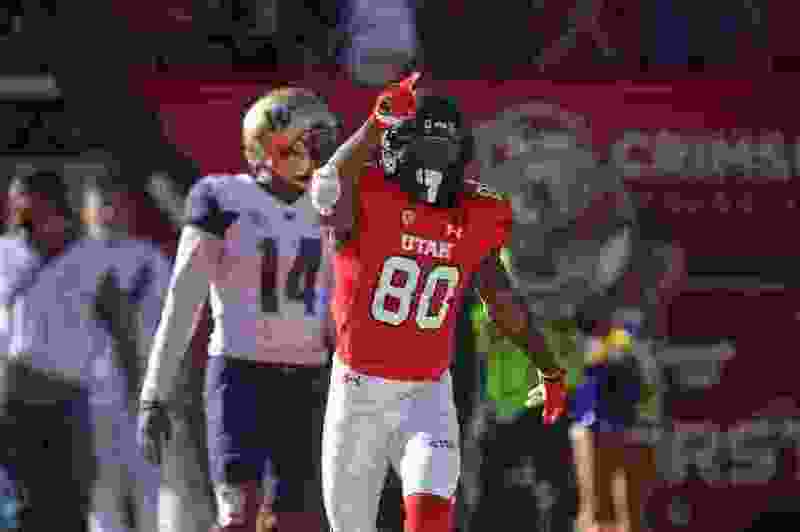 Leah Hogsten | The Salt Lake Tribune Utah Utes wide receiver Siaosi Mariner (80), who has changed his last name from Wilson, celebrates 6-yard touchdown to take the lead early in the second half. University of Washington Huskies defeated University of Utah Utes 31-24 at Rice-Eccles Stadium, Saturday, October 29, 2016. People are saying nice things about them, but the Utah Utes know the truth: They haven't done anything yet. Picked to finish a strong second in the Pac-12 South in last week’s official media poll, the Utes start preseason practice Wednesday with an element of anger as they keep targeting the program’s first division championship. “This team, it’s almost like they have an axe to grind, something to prove,” coach Kyle Whittingham said. Hardly anyone believed there was genuine competition for the starting quarterback position last August, until the moment when Tyler Huntley surprisingly unseated Troy Williams. Huntley remains the starter after performing well in the spring, so this August’s battle is between freshman Jack Tuttle and redshirt freshman Jason Shelley for the No. 2 role. Tuttle might be the most celebrated quarterback recruit in school history, making his case especially interesting. Shelley's development will play a part in how the coaching staff handles Tuttle, with a new NCAA rule that allows athletes to play in as many as four games and maintain redshirt status. Huntley's health also figures into that discussion. Who will emerge among the receivers? In an offensive scheme that will use four or five receivers in some formations, this position area clearly is Utah's biggest personnel variable. Athlon ranked Utah's receivers/tight ends 11th in the Pac-12; no other Ute group is listed in the bottom half of the conference. The Utes relied heavily on Darren Carrington II in his one season as a graduate transfer. The logical replacement is Britain Covey, who’s back from a church mission after catching 43 passes as a freshman. In his remaining three seasons, Covey should challenge Kevin Dyson’s 192 career receptions, the school record. But the Utes need more targets than Covey, among many possibilities, including Derrick Vickers, a 2017 junior college signee who was added to the roster Monday. “All we need is two or three of them to step up,” Whittingham said. During last week's Pac-12 Media Day, Whittingham mentioned Siaosi Mariner as “ready to have a breakout year.” Linebacker Chase Hansen labeled Demari Simpkins “one of the more underrated guys in the conference,” after his showing in summer workouts. The Utes also have big expectations for freshman receivers Solomon Enis and Terrell Perriman, along with Texas Tech transfer Bronson Boyd. How healthy is Marquise Blair? Utah's secondary could become the program's best group since 2008, when the Utes featured future NFL players Sean Smith, Brice McCain and Robert Johnson. The move of Hansen to linebacker is an endorsement of the safeties, with Blair and Corrion Ballard expected to start. Blair missed the last five games of the season due to injury and was held out of spring drills, but is approaching full health. He's a ferocious hitter. Who will emerge up front? The Utes rotate so many defensive linemen that identifying starters is not a major issue, but it will be interesting to see who plays their way into those jobs, alongside end Bradlee Anae and tackle Leki Fotu. Mika Tafua has impressed the coaching staff since arriving on campus last fall and could become a starting end, although he's listed as the backup to Anae (Caleb Repp is No. 1 on the other side). Pita Tonga and John Penisini are the top contenders at tackle, next to Fotu. On the offensive line, right guard Johnny Capra is favored to become the fifth starter, joining four returnees. Watch for redshirt freshman Nick Ford to contend for a starting tackle spot, possibly creating a different alignment. Do the Utes have enough depth? With crossover opponents Washington, Stanford and Oregon from the North, the Utes have the toughest schedule among the Pac-12 South’s contenders. Their bye comes in September, so they will play eight straight weeks of conference games against some very good teams, followed by the regular-season finale vs. BYU. The Utes have been known to wear down in November; they’ve lost Game 11 of the season for six consecutive years. The recruiting and development efforts of Whittingham’s staff should enable the Utes to finish stronger, while the coaches manage their roster with the flexibility of the redshirt rule. In position areas judged to be less deep than others, Whittingham said, he’ll try to save some young players for November. Utah’s preseason football camp will include one practice each day (except Sundays) from Wednesday through Aug. 18, when the annual Fan Fest will be held from 6-8 p.m. at Rice-Eccles Stadium. All practices are closed to the public. The Utes will adopt their in-season practice schedule Aug. 20, when classes start. The season opener is Aug. 30 vs. Weber State. • Developing the receiving corps. • Solidifying the defensive line rotation. • Building depth among newcomers. • Picking a No. 2 quarterback.